In an effort to learn and move forward, I have one upped my Double Stone Graft experiments and wish to create a super Mango rootstock with accelerated growth, increased adaptability to bioburden and different soil conditions and without the unnecessary expenditure of energy spent on flowering that is encountered with the Double Stone Grafted trees. http://tropicalfruitforum.com/index.php?topic=16549.0 which unfortunately flowers in less than one year from grafting when grown in cool climates. In order to accomplish this, I will be utilizing root pruning technology combined with multiple rootstock technology, especially emphasizing the use of specially selected rootstocks from dynamic geographies. Root pruning via MicroKote painted pots will inhibit root circling and promote a dense and fibrous root system that is more capable of up taking nutrients and water. I am developing this technique for backyard Mango growers attempting to grow this fruit in marginal climates and/or marginal soil conditions. Because the average dooryard gardener lacks the resources to test out rootstocks in a scientific manner, I will be using multiple rootstocks in hopes that any one of the given rootstocks will perform better than another. The more diversity of rootstocks I use, the broader the range of growing conditions I hope my trees will be able to handle. In this experiment, I will not be grafting a named cultivar onto the multiple rootstock tree, at least not initially. I will simply be innarching them together to create a melting pot of rootstocks. I will be growing these multiple rootstock trees in their root pruning pots for 1-2 years while stepping up the size of their root pruning containers in order to increase the density of roots which should enable the tree to be planted directly into the ground with little or no transplant shock. My first round of multirootstock trees will be planted in very close proximity in order to minimize the footprint and facilitate grafting although this will surely restrict root growth to some extent due to extremely close competition between the roots within a pot. This phase is more of a testing of the waters which will help get my hands dirty before I begin my next phase of tests. With my a double Stone Graft experiments, it took me lots of trial and error work before I finally nailed down the process to be as efficient and streamlined as possible. I'm eager to see what the rootmass will look like since I have 6+ seeds planted into a container about the size of a 1 quart jar. In my DSG thread(link posted above) you can see pictures showing the root system of several seedlings. The taproot can reach 6+ inches before the mango sprout even pops out of the soil so these seedlings here should have already been chemically root pruned by the time they sprout. I just re read my first post and to those of you that have not been following my Double Stone Graft experiment, it would sound like I'm trying to create a non flowering mango tree, lol! Not true. In order to achieve a large fruiting Mango tree in as short of a timeframe as possible, we need to inhibit flowering of our young trees/rootstocks. 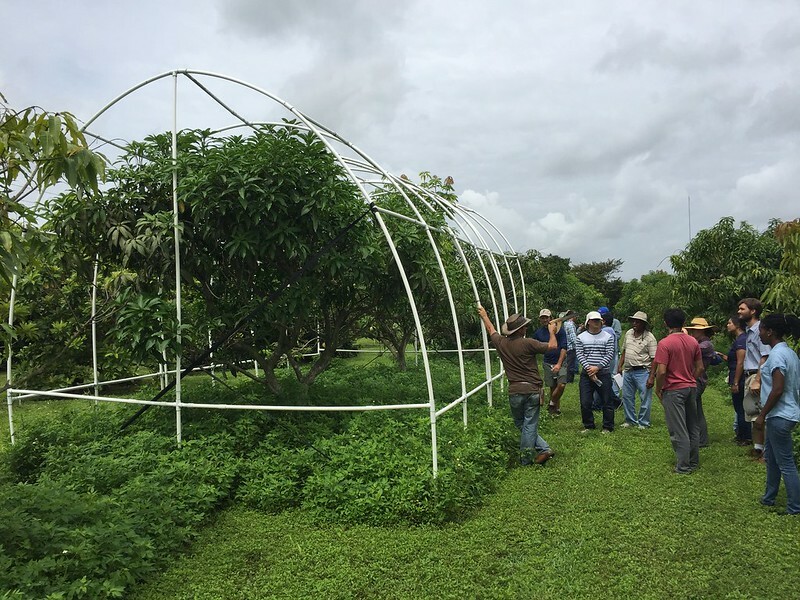 Mango trees grown in cooler climates must achieve a canopy size and trunk diameter of a yet unspecified critical mass before allowing it to fruit in order to avoid unnecessary expenditure of resources in flowering and fruiting. Grafting mature scion onto the rootstock will surely induce blooms during cold weather. So when should I top work the Super rootstock? The benefit of the Double Stone Graft is that I only needed to graft a single scion onto the double rootstocks but this leaves me with a small plant wanting to bloom its first year. If I wait too long, I will have a huge tree with multiple main branches with hardened brown wood that is much more difficult to graft and will require the use of multiple scions. I will probably grow the Super rootstock to about 3-4 feet tall the first year at which point I will top it and wait for the new shoots to form at the top. I will then select 3-4 evenly spaced branches to form into the future scaffold branches. I don't want to side veneer scions onto the main trunk as grafting mature scions will induce blooming in Winter. I will keep this Super rootstock tree outdoors in the air pruning containers until the tree has been up potted several times and the roots are dense and have filled the final size container. The tree at this point should be 5+ feet with 3-4 scaffold branches with a good amount of leaves on each main branch. At the end of year two or the beginning of year three, I will head back each of the 3-4 scaffold branches leaving approx 6 inches of branch where I will bark graft each of the splits. In other words, I will be topworking this tree. By doing this, I hope to capitalize on the strong root system and hopefully high vigor of the tree to push the grafts. Timing is critical for this last step and I hazard to guess that June-July will be the ideal months to graft Mango in SoCal with minimal risk of flowering. By grafting in June, this tree should grow vegetatively until November or December when it will most likely flower. Flower and fruit will be removed for the first year or two after field planting in order to allow the tree to fully establish. If the bark grafts fail for any reason, the vigor of the tree will in all likelihood push new sprouts from below the heading cuts. These shoots can also be grafted. Please excuse my brainstorming session, I'm still trying to figure everything out. My next round of experiments are nearly identical but the seeds are planted farther apart giving each root system more room to grow but making it more difficult to bend the seedlings together for grafting. Previous pictures were from 1-2 weeks ago, here are some updates. Did you see the youtube vid with grafting Mango by bark? I never heard of that. I've seen all The Shramajeevi videos and several others on bark grafting. I've done several bark grafts on Mango with good success. It's just so much easier to perform greenwood grafts. Here is an update after the initial approach grafts. I've still got lots of grafting before all the rootstocks are connected. Several of the rootstocks I am using in this experiment were selected because of favorable growth patterns I've personally witnessed or because of anecdotle reports that it may grow better in a particular type of soil. I used a combination of Monoembryonic and Polyembryonic Mango seeds because of the reports in CRFG and other sources that hint to Monoembryonic Mango trees being more resistant to Powdery Mildew whereas Polyembryonic Mango trees are reported to give better resistance to Anthracnose. I would like to thank Mangofang(Gary) for sharing his seeds from his large Manilla Mango tree with me. Manilla is going to be the primary rootstock I attach all other seedlings to because of its proven ability to grow in my high pH, heavy clay and low oxygen soils. I will likely test out other varieties as the "Main" rootstock such as Fairchild(thanks for recommendation Zands), Lemon Zest and Sweet Tart. If I can get a hold of some Kesar seeds, I would like to test it out as the main rootstock as well. I have made 2 Fairchild seedling rootstock for you for your trials. I will give them to you (should they survive) when I see you in September. btw, do you really get anthracnose in San Diego? Thanks Warren, that would be great. Yes, I get lots of Anthracnose in my yard. My yard is very moist in the mornings and my mangos usually have some Anthracnose when I pick the fruit from the tree. The Anthracnose really reveals itself when I set my fruit on the counter to ripen. By the time the fruit are ready to eat, there are usually at least several spots on them. I have not fruited many varieties of mango in my yard but my Mahas and Glenn get Anthracnose. My Lemon Zest and Pineapple Pleasures are clean so far but they are far from being ripe. I am trying to see if I notice a pattern for Anthracnose infections such as if the Polyembryonic or Monoembryonic mango varieties tend to get it more, nothing so far. It's been about a week since I've made the first cuts on the rootstocks and the innarched seedlings tops are starting to push again so this tells me that the healing process has already started. The seedlings come from a diverse background and it shows in their rate of growth and the smell of their leaves. When grafting newly sprouted seedlings, the first thing you will notice this that the main trunks/sprouts are extremely juicy and fragile, more like a tomato or melon sprout compared to a stiffer greenwood Mango stage. For making cuts on these fragile stalks, I like to use razor blades instead of the box cutter I normally use. Because these sprouts are so fragile, you have to be very careful not to cut through the entire stalk. As soon as you make the cut, sap will immediately start to come out of the cuts which may make it a bit more difficult to wrap because it will be slippery and the parafilm may not stick to itself. Because so much moisture is lost, I remove several leaves from the top of each grafted seedling, this will also allow more light to make it to the smaller, newly emerging seedlings. Here is an in situ grafted Venus on single Kent rootstock that decided to bloom now, in August, this is the reason why I must wait until June-August to graft. The earlier I graft, the more time I will give my plants to push the scion but grafting earlier in the year also increases the risk of blooms. The later I graft, the less time I give the scion to push vegetative growth before winter but this increases my liklihood of getting a vegetative instead of floral push. Venus is supposed to be a later season mango but I wonder how late is too late? I know Leo gets high quality Winter mangos but I wonder just how late we can actually push it without being detrimental to fruit quality. "I will probably grow the Super rootstock to about 3-4 feet tall the first year." This is amazing growth rate!!! I never could get my seedling first year over 2 feet. Too much loving could kill my mango. How do you push it so fast? Pull in front or push from behind ? In this photo I can't see the green color seeds that usually presented next to those young seedlings. Were they being covered under the top soil? I found those "egg york" seeds would be rotted too fast if they were covered. Hey Sapote, I have no issues germinating Mango seeds. They usually germinate in 1-3 weeks, average around 2 weeks. The key is to give them full sunlight which should bring the soil temps in the pot around 90-100+F. The warmer they are, the faster they sprout. I'm sure, I occasionally get a rotten seed but I plant so many seeds that I usually have enough for my needs. I like to plant my seeds about 1 inch below the soil. If I feel I have a weak seed, say perhaps from a Polyembryonic seed, I may plant the embryo right at the surface. The issue I have with planting the embryo at the surface is that the top 1 inch of soil dries out really quickly and when the seedling sprouts, the sprouts can be top heavy and start to lean down because the sprout was not anchored below the soil. "I like to plant my seeds about 1 inch below the soil." Very interesting. I assume you meant the top of the seed was 1" below the soil. This had not worked for me -- they were all rotted. I seeded mine just the same way in nature, except hush-less: half the seed above soil and in warm but under shade. In full sun they failed on me. With seedlings in the tall milk carton about 12" tall, I don't have circled tap root in one year and just planted the whole carton after making some vertical cuts around the box. No soil fall-off issue. Hey Sapote, I have not accomplished this yet, this is only a goal and it is based on my observations that the Lavern Manilla are approximately 1 year old, most of them are 3-4 feet tall when I purchase them. I have heard that Lavern grows their seedlings in a greenhouse so I will be at a disadvantage but I have the benefit of multiple root systems. I am documenting the entire process with pictures of the progression so that the growth rate can be validated. It would be too easy for anyone to claim they had a seedling grow ten feet in 3 years but to see pictures of the progression to verify the claims would be even more spectacular. Hi Simon. I love what you are doing here. Thank you for taking the time to document all of this. I have some multi rootstock projects come up soon and a few little things I have been messing with in the past 6 months. If you are really interested in the multispecies approach this article will help you a lot. I just had a farm tour and class a few days ago at Fairchild Farms with Dr. Richard Campbell. He got into a lot of things but he went into great detail with this fantastic breeding program they are doing there. They already have some successful crosses between species and have been planting out the seeds for years. What would be really helpful for you is their experience with interstock grafting for compatibility with the turpentine rootstock they use for the limestone they plant into. He also said that next years mango festival will be the "wild" species theme and they will have grafted trees available to purchase! The casturi mango is delicious by the way if you haven't had it. Also, have you thought about planting in oversize mounds? I am dealing with muck at my home planting and I am going to be reworking with with augering through the compressed ancient swamp bed, amending with biochar and perlite, and making huge planting mounds. The few plantings I did this for are really thriving. I am a big fan of putting in the extra effort in dooryard plantings to push things into the more ideal microclimate. I am going to take some pics and videos to track the progress. Here is a picture of Richard Campbell in front of the shell of the isolation cage from one of the wild/indica crosses they did. I forget which species this was. This really is an incredible time to be a mango grower. Hey Josh, thanks for the information! Hopefully Dr Campbell will be successful with his crosses, sounds like he already is. I would believe he is likely breeding for better adaptation to fungal issues while keeping production high. I'm sure the crosses will help with better adaptability to high pH and wet growing conditions as the article i posted shows there is real potential there. I rely heavily on forum members like you to help me along as I am completely oblivious to what going on over in Florida. I hope that what Dr Crane and Dr Campbell does will help all of us dooryard growers. From what you have posted, their experiments are the real deal with scientific controls and a planned goal. I'm just a backyard grower with several spots in my yard playing around with grafting in the hopes of developing a technique that can benefit people growing Mango in marginal climates. Please keep us updated with what you find out. If you can find out what species they are using and the goal of using that species, such as resistance to anthracnose, that would be great. I'm especially interested in acquiring rootstock of these new hybrids. tyanjs again for relaying the information, it really helps! Here's the second part of my experiment. This set of seeds was planted slightly farther apart making it easier to wrap with grafting tape and giving the seeds a little more room to spread out. For this experiment, I planted the seeds inside a large MicroKote treated pot. The point of this experiment is to see if I will get similar root pruning benefits if the seedlings are not stepped up in pot size. I feel that by purposefully cramping the roots in a small Root pruning pot, it will promote faster root pruning and provide for a more dense root system. For this experiment, the seeds are in a large root pruning pot and they will not be stepped up. I believe the roots will sprout from the seeds and go straight down until they hit the bottom of the container. Once it hits the root pruning paint, the root will be tip pruned and stimulate root branching. Because these seeds are in a large and deep pot, the root pruning will not occur until the roots hit the sides or bottom of the container. While grafting these seedlings last night, I noticed that each seedlings sap smelled similar to the taste of the fruit. For example, when I cut into the Lemon Zest seedling, the sap smelled like Lemon Zest. Because LZ is Polyembryonic, this may be one method to determine which seedling is the clone before the mature leaves have formed. Once the mature leaves have formed, you should be able to tell which is the clone by the wavy look of the LZ leaves. I'm not sure if the Zygotic LZ seedling will have the same LZ smell or not, my hand was cross contaminated already so after I cut one of the LZ seedlings, everything smelled similar. Here is a look at the roots from my first set of experiments where the seedlings were cramped into a small pot allowing them to get root pruned much earlier. You can see there are multiple root tips trying to poke out of the drainage holes. I'm hoping that there is already a dense fibrous root system starting to develope inside this cramped pot. I will be up potting into a larger root pruning pot in the next couple days. One issue with large pots is the tendency for roots to shoot downward and circle the bottom of the pot. The deeper the pot the larger the root void I would think. I am sure you will still be light years ahead of a nursery grafted tree that is ALWAYS shaped like a 1 gallon pot. Actually, Pine Island Nursery recently started using smaller than 1 gallon pots to grow out their mango rootstock for grafting. I have heard that Zill crumbles the leaves and smells them when he is doing his breeding with the seedling trees. You can really tell a difference in the fruits when you smell other parts of the plant. Thanks for the info Josh! Every pot for this round of experiments is in MicroKote treated pots so once the roots hit the bottom, they should be root pruned instead of having their roots circle. I have trays of seedlings in super cramped MicroKote treated pots to see if I can induce early dense hairy root growth. A dense hairy root structure will better utilize the soil, nutrients and water. I hope to grow these seedlings and allow root pruning to occur before up potting them to larger root pruning pots. Once I dig up some of these seedlings, I will try to get a good picture to see if I get a more dense and fibrous root system than when grown in traditional pots. Is there updated pictures of your experiment? Paint laden with copper hydroxide painted onto conventional pot bottoms and sides is close to 100% efficient in terminating root tips which induces lateral branching....more root mass. I'm still on my Griffin's Spin-out paints but here's an old DIY thread of making your own. Air/light pruning using RootMaker products or Smart Pots are very efficient too. Microkote used to be made under the brand-name SpinOut by Griffin L.L.C. until SePRO bought the rights. After the re-branding they added other metals labeled as "nutrients". In my opinion this is all marketing; the roots will be stopped and not absorb anything near the Microkote layer - so really the only active ingredient is the chemical that stops the roots from growing further (this chemical is copper hydroxide which was the original ingredient in SpinOut). Microkote is pricey ($28 for 8oz). But you should be able to make your own. KOCIDE 3000 (made by DuPont) or http://kingquenson.en.alibaba.com/productshowimg/424951536-200579235/Copper_hydroxide.html. 2) Dilute the Copper(II) Hydroxide in latex paint. The original SpinOut was made with 13 oz/Gal of Copper(II) Hydroxide (source: http://hortsci.ashspublications.org/content/28/5/527.6.abstract). Remember to account for the original concentration of dry Copper(II) Hydroxide in the pesticide bag (this is typically 50%, for which you would add 26 oz per Gal of latex paint). Remember to read all the instructions in the bag when handling pesticides. This costs about 10x less than buying the Microkote solution which is over-priced and over-marketed (b/c of those extra additive "nutrients") in my opinion. I've been sick for several months so I fell behind on a lot of my projects but these trees are doing very well with accelerated growth compared to single rootstock trees. I had an experiment where about 7 seedlings were grown in a very small pot with the plan being that I step up the size of the container as the roots filled the pot but I completely neglected this tree and it is still in the same pot but growing great although I'm afraid to see what the roots look like even though I used the root pruning paint. I'll update with pictures when I get a chance. I'm sorry to hear you have been sick, Simon. I hope you get well soon. I always enjoy your posts and follow most of your experiments with great interest. I hope it's nothing serious and you get better quickly.